Microsoft SmartGlass is "a Great Way to Spy on Your Kids"
Could SmartGlass act as a monitoring tool for parents? During a GDC talk today in San Francisco, Microsoft's Rosa Thomas spoke to attendees about the benefits of using the company's SmartGlass platform for second screen experiences. While most of the discussion focused on how developers can utilize SmartGlass for their own purposes (this is GDC after all), Thomas did mention reveal one rather peculiar usage she has found for the Xbox SmartGlass application: Monitoring the activities of her children. 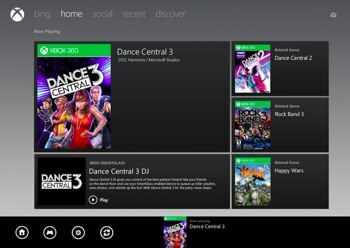 "You get to know what's happening on your Xbox wherever your Xbox is," Thomas explains. "So, interesting enough, I was at work, testing my stuff, and I'm looking and I forgot that I had actually connected to my home Xbox, and I got to see what my kids were doing at home. It's a great way to spy on your kids, I'll tell you." Now, while her comment was delivered in a completely off-the-cuff manner, it does shed some light on how powerful of a tool SmartGlass could become for parents. Using SmartGlass, an individual can completely control the functions of whatever Xbox 360 it is linked to. In fact, Thomas later added that she got a laugh out of repeatedly pausing her husband's Netflix stream while he sat at home trying to figure out why his movie kept stopping. The days of a youngster flipping on the game console as soon as the parental units depart for work could very well be coming to an end. The horror!